Hey Tayo is back in action. This time Hey Tayo performed the action during the graduation ceremony at the Dramaga IPB University Campus, Bogor (13/3). There are two Tayo spot points, namely in the second floor left corridor of Graha Widya Wisuda Building and gladiator plaza rectorate. This spot for exchanging rubbish with souvenirs was visited by families of graduates. This program takes the moment of graduation with the aim of providing education to families and assistants of graduates so they can sort waste properly. At the moment of Graduation and Submission of the Diploma V of the 2018/2019 Academic Year Undergraduate Program, Veterinary Professional Education, Masters and Doctorate in the IPB Environment, IPB handed over a diploma to 800 graduates, consisting of 531 Bachelor graduates, 25 graduates Veterinary Professional Education program, 211 master degree graduates, and 33 doctoral graduates. Chairperson of the organizing committee Hey Tayo, Dr. Danang stated that the concept of exchanging waste with souvenirs prepared from the collaboration of the Department of Resources and Environment (ESL) with Agrianita IPB University could educate about sorting plastic waste and reducing waste on campus. "We intensified Tayo's activities. We make the weekly routine in the department bigger, become monthly at the IPB University level and do each graduation period. It is targeted that this year the Tayo movement will continue this year at every graduation ceremony, "he explained. From the results of the evaluation, it was recorded that no less than 250 people from among the residents of IPB University had participated in the Tayo 202 movement before. 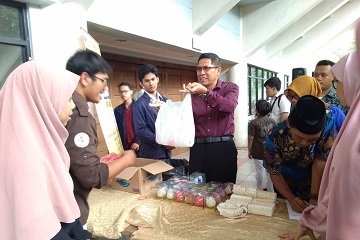 Secretary of the ESL Department of IPB University, Dr. Meti Ekayani, S.Hut, M.Sc hopes that this activity can support IPB's Green Campus with one of its indicators, which is managing waste, reducing plastic waste from consumption leftovers distributed at graduations and providing education to graduates' families not to leave trash in the graduation room. "With this program, later when they get out of the graduation building, they want to bring the trash and sort and dispose of the garbage in its place. "As a form of appreciation, we give souvenirs and hope that in the future it will be cultured and used to throw trash in its place," he added.